New shamanic healing rattle has arrived! A little over a month ago, my wonderful and powerful Coyote Rattle exploded. It began very subtly. At first, the black wrappings started to loosen. Then, the coyote rattle-head started to soften and muffle. Finally, I used it during a healing appointment and the whole thing came apart in my hands (super intense appointment!). I've always made my own rattles, either with rattle kits, or purchasing materials and creating it from scratch. I worked very hard on my Coyote Rattle, and although it looked a bit weird, and sounded even stranger, it was mine, and put me in spiritual headspace with a flick of my wrist. I decided that although I loved to create my own spiritual tools (rattles, runes, etc. ), I wanted a professionally-created rattle that would last. I found a gorgeous one from a maker in Denmark, and stared at it lovingly for about a week. Rattles are tricky things, and although different ones look amazing, it is really all about the sound (that puts the shaman into Otherworld headspace). There's no way I could tell what it would sound like until it was in my hands, so I threw some Runes, converted some dollars, and purchased it. It arrived the other day, and I had to giggle at the timing. I had made my previous rattle during a Mercury Retrograde, and this one arrived during the current Mercury Retrograde! I've used it in a couple healing ceremonies, and I both enjoy the sound and the fun energy of it. 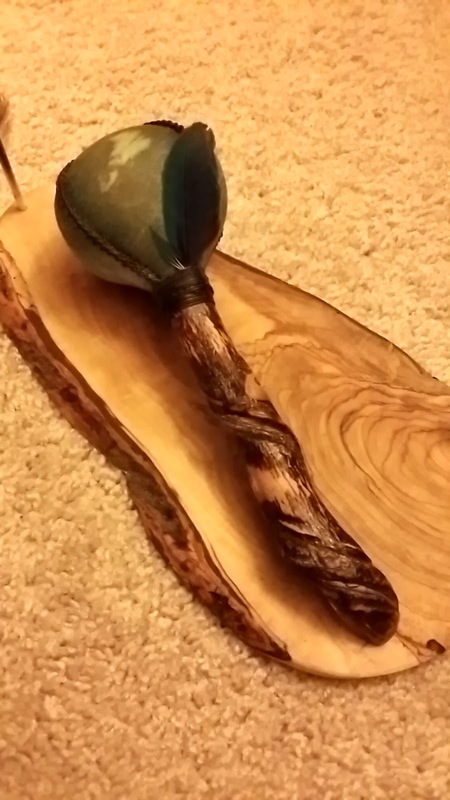 The twisted birch handle is the perfect thickness, and the Blue Macaw* feathers add a joyous tone to the work. I am making a little rattle case for it, so that it stays protected on all of our travels. How did you find your first rattle? Current rattle? Do you like to make them, or purchase them? What is your favorite rattle hide? You'll benefit from getting out in the sunlight for at least a few minutes each day. You're at the beginning stages of heightened spiritual perception and an increased creative pulse. You're going to notice a shift in your communication abilities that prompt people to pay attention and listen closely to what you say. Trust your perceptions, no matter how outlandish and bizarre they seem. Wear brighter and more colorful clothing, no matter the season." -- from p. 237 of Steven D. Farmer, PhD, Animal Spirit Guides, (c) 2006.